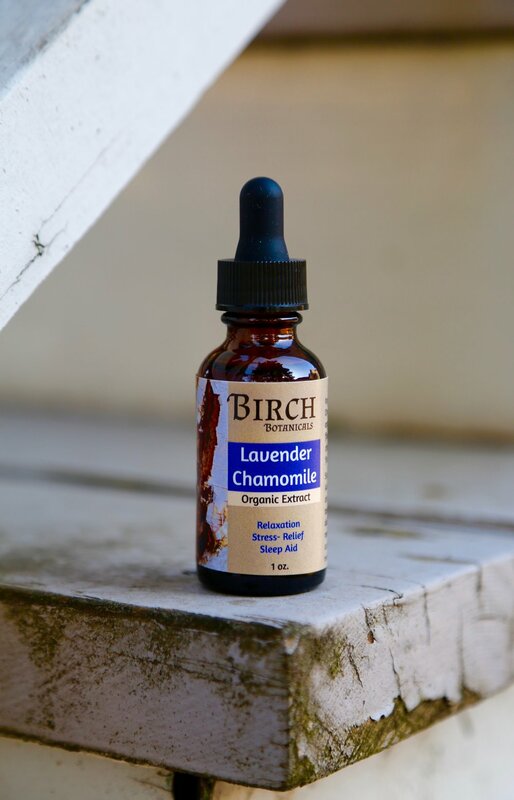 For those who struggle with stress, tension, or trouble sleeping- lavender & chamomile are the perfect pair to help a stressed nervous system unwind. 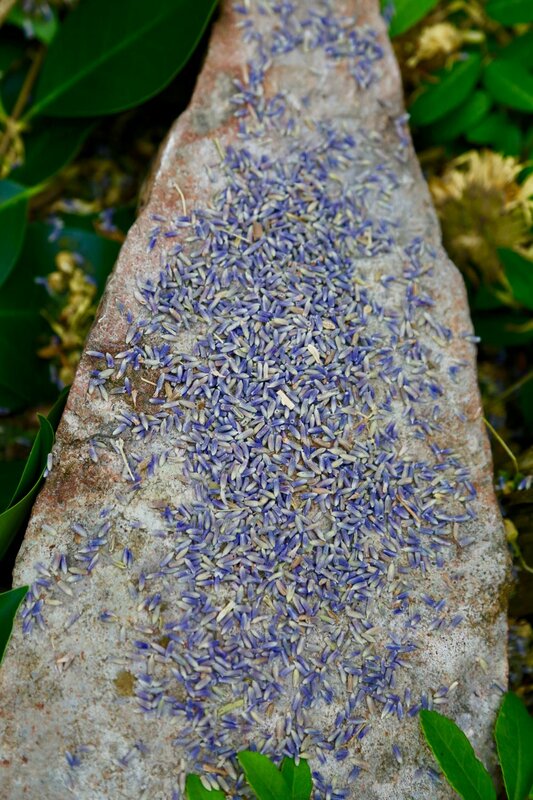 Lavender is well known for its properties which can help tame anxiety, depression, insomnia, and digestive issues. It is also a pain reliever, and is especially helpful for headaches. Chamomile has been a popular herbal remedy since the Middle Ages, used for its soothing properties both on a stressed nervous system and an upset stomach. A tincture is an herbal preparation using alcohol and fresh or dried herbs. The herbs are steeped for at least 4 weeks, releasing the medicinal qualities of the herb into the alcohol. It is then strained and taken internally, usually just a few droppers full each day or whenever needed. 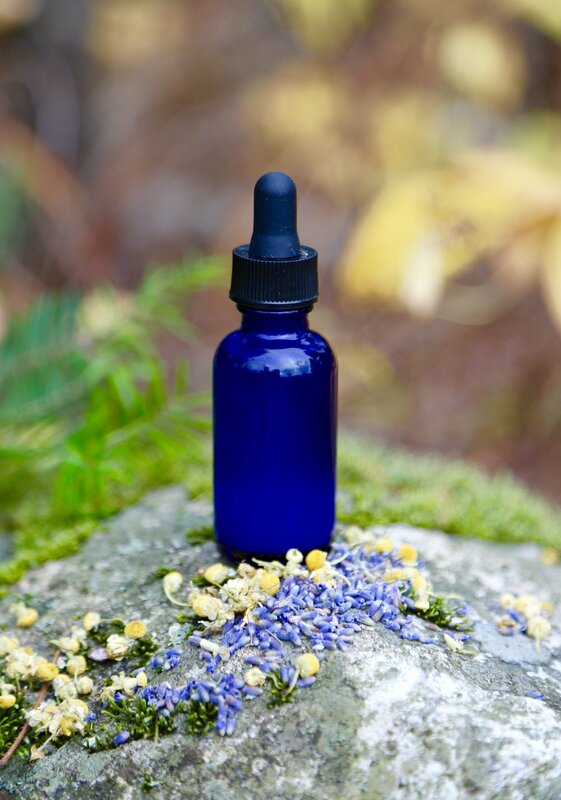 Tinctures are one of many ways to administer herbs internally, but they are one of my favorites for a busy lifestyle because they are ready made, easy to take, and are compact which makes them great for on the go and travel. Step 1: Determine how much tincture you will make. You will be using a 2:1 ratio of alcohol to herbs. Then finely chop your herbs. Step 2: Locate your glass jar, and pour in your chopped herbs. Make sure you leave at least 2 inches of space above your herbs. Step 3: Pour the alcohol over your herbal matter. Completely saturate the herbs, then keep pouring until the alcohol is 2 inches above the herb matter. Step 4: Place your lid on your jar and tighten. Then, label your Sleepy Time tincture, including the date of preparation, type of alcohol used, and types of herbs used. Step 5: Place your jar in a dark, warm room. You will be leaving your herbs to soak in the solvent for 4 weeks. During these 4 weeks, shake your jar daily. This helps break open the cell wall and release the oils and medicinal properties into the solvent. Be sure to keep your jar out of direct sunlight. Step 6: After the 4 weeks, you may strain your herb matter from the solvent. Your tincture is done! Step 7: Bottle your tinctures into small glass dropper bottles. Label your tinctures ingredients and indications. If stored out of direct sunlight, tinctures will never expire! Dosages differ depending on your condition and the alcohol used. For a standard dosage, take 10-15 drops of tincture twice daily. To combat an existing headache or other condition, take 5 drops every 30 mins for up to 3 hours or until symptoms subside. Keep this tincture with you to combat stress during a busy day, or take it before bed for a more restful night sleep. Enjoy! Lavender and chamomile are the perfect pair to calm the nerves after a stressful day, promote deep sleep, and reduce stress and anxiety, and depression. This pair is also beneficial in preventing and aiding recovery for colds and flu, calming muscle spasms, soothing stomach aches, and promoting healthy, glowing skin! *All Organic Ingredients: gluten-free vodka, lavender and chamomile flowers. *Suggested Dosage: take 10-15 drops under the tongue or diluted in water twice daily or when needed.